Not all of the news that Android Police has been able to nail down about Google's upcoming hardware is positive. In addition to a lack of MicroSD card slots (despite some exciting new functionality in Android Marshmallow) and a lack of wireless charging (despite the fact that the last three generations of Nexus phone had it), both LG's Nexus 5X and Huawei's Nexus 6P won't have optical image stabilization built into their rear cameras. That's definitely a bit of a bummer, especially since the Nexus 5 (2013) and Nexus 6 (2014) both included the premium camera feature. Optical image stabilization adds extra elements to a camera lens or module that can compensate for a small amount of vibration, such as a slight wobble in the hand of the user. Since taking photos on a phone can be difficult enough thanks to low weight and a lack of grip, it's been a popular add-on for premium smartphone designs for the last few years. A module that compensates for vibration is also a huge boon when taking low-light photos. We don't have a hard reason for the exclusion on the latest Nexus phones, though it's a pretty fair bet that Google simply wanted to keep the price for both as low as possible. (Last year's Nexus 6 earned no small amount of complaints for its flagship $650 starting price, and the Nexus 5X and Nexus 6P will start at $379.99 and $499.99, respectively.) In the case of the 6P, it might have something to do with the non-standard, extra-dense sensor, but that's just speculation. Update: we've confirmed that the lack of image stabilization is, in fact, due to the new 1.55µm pixels in the image sensor. 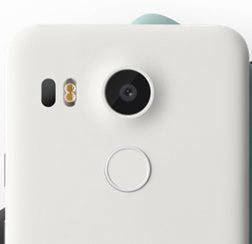 Presumably that means that the Nexus 5X will include an extra-dense camera sensor as well. Google's Nexus announcement is tomorrow, September 29th in San Francisco. Both phones are expected to be available for pre-order after the event.